Did you know the average life span of a loon is 30 years? Loons grow 2-3 feet in length. And how about this one... Loons can dive more than 200 feet below the surface of the water. I didn't know that either, but after working on this project for the past 3 springs, I have become a bit of a wise guy in the world of loons. Welcome to Loon Cam 2010! Minnesota's state bird will once again be front and center this spring as our crew at Minnesota Bound has launched its famous "Loon Cam". The Loon Cam first made its appearance in the spring of 2008, and was an immediate success. Last year the cam had a half a million views over the short thirty day period. This year we willl surely blow that away. The response has been overwhelming, and it's one of the most watched wildlife webcams in the world. So what can you see? Well, basically everything. Since the loon cam went LIVE about a week ago, we've witnessed the loon mating rituals, nest building, territorial battles, and even a few intruders. Not only that, but the actual laying of the egg has been a popular discussion. Today we witnessed mother loon lay the first of what we anticipate being 2 eggs. Will she successfully lay another? Will her eggs hatch? We will have to wait along with everyone else. Larry Backlund is the resident loon expert and he shares years of experience. He has a way with words that captivates the audience every year, and his genuine care for the loons is unmatched. Larry has been successful with his loon nesting platform for over a decade, a feat that is pretty tough considering most loon nests are used less than 50% of the time. Regardless, he has the passion, and he knows how to share it with all of the viewers. 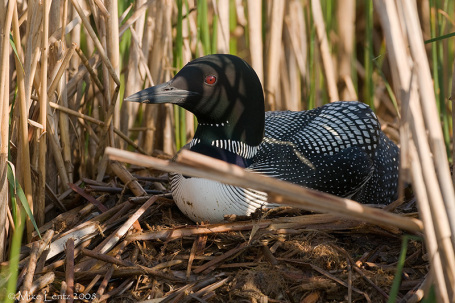 This year the Loon Cam will run from April through June. Whether you are a bird watching guru, or just an outdoor enthusiast, this rare look will certainly keep you occupied while at work, home or in the classroom. Oh, did I mention we added sound and night vision to the camera this year? Yep, these features give the ultimate in bird watching, and are sure to make the 2010 season one for the record books. You'll just have to watch for yourself!